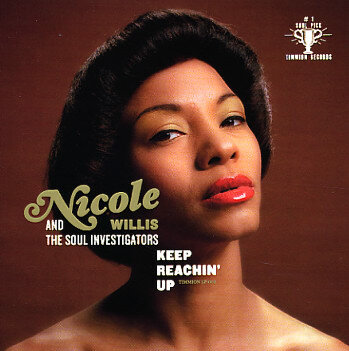 Singer Nicole Willis and Finland's premiere Funk band The Soul Investigators release their debut album Keep Reachin' Up. The album is released by Timmion Records, with distribution by BoomBox Distribution in the UK. The albums lead single If This Ain't Love (Don't Know What Is) was nominated by Gilles Peterson of BBC Radio 1 as one of the best songs of the year 2005. Deceivingly simple and up-tempo and inspired track, If This Ain't Love brings to mind the best releases by legendary soul labels such as Motown and current music by the likes of Sharon Jones & The Dap-Kings. Peaking at number 4 on the national Finnish charts, If This Ain't Love has been lauded by the Rare Groove connoisseurs as the Northern Soul anthem of the new millennium. "The sound of this group reminds me of dancing to the new James Brown 7" in the record shop on Clarkson Avenue with my sister when we were 6 & 8 years old", the Brooklyn-born Nicole has described the album. The follow-up single My Four Leaf Clover, released on 45 rpm in the coming weeks, continues in the same style. The albums production courtesy of Didier, the man behind the rough sound that the Timmion label is known for is sparse, but rich in detail and showcases Didier's knack for keeping the sound cohesive. Nicole's vocals fit to a Tee to the funking backing of The Soul Investigators. Nicole Willis states it plainly, always on the cusp of a new event, pares with native Helsinki-New Orleanzified Soul Investigators with her 3rd album. Nicole Willis recorded 2 albums fronting New York based Acid Jazz group Repercussions titled Earth & Heaven & Charmed Life on Warner Brothers & Pony Canyon respectively. She has since released two solo albums both on Sähko/Puu Recordings. The sophomore Be It 2004 and the critically acclaimed Soul Makeover 2000, which was described by The Face as 'possibly the best R&B album of the year'. Both albums feature production credits from husband Jimi Tenor, Maurice Fulton, Veikka Ercola, Nuspirit Helsinki & the artist herself, Nicole Willis. The Soul Investigators, under different guises like Didier's Sound Spectrum, Ostari Njengi and Soultors, have impressed fans of Deep Funk for nearly a decade. Their numerous 45 rpm releases like Chicken, Soulful Trip and U-Bo-Te and LP's Soul Strike! (Soul Fire, 2001) and Home Cooking (Timmion, 2003) have found their way onto the turntables of vinyl enthusiasts all around the globe. Keep Reachin' Up is a sure-shot album that is not to be missed!